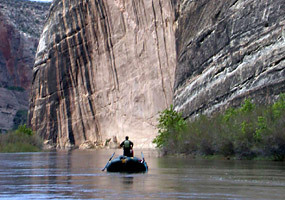 Glen Canyon sacrificed to save Steamboat Rock. Which of these two stunningly beautiful, one of a kind, world class, historically priceless, irreplaceable, works of nature should the US government totally sacrifice, obliterate and destroy, so no future generations would ever see it? Choose one: A or B? “A” is the stunningly beautiful Steamboat Rock in the Echo Park district of the Dinosaur National Monument in northwest Colorado. “B” is the stunningly beautiful Glen Canyon in the Vermillion Cliffs of southeastern and southcentral Utah and northcentral Arizona. 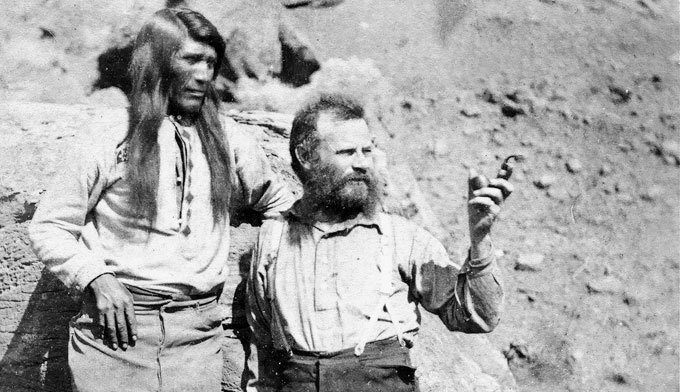 John Wesley Powell and a Native American. 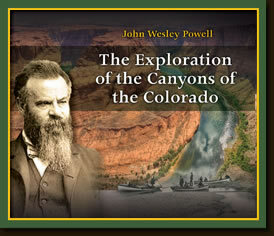 Powell was the first white man to travel down the complete length of the Colorado River. The problem was this: after Powell’s death defying journey down the unknown Colorado river in 1869, the mighty Colorado river became vitally important to all residents of the Southwest United States as the major source of life sustaining water. Hoover Dam from down river. The US government has harnessed the power of the Colorado by creating Hoover Dam, where the Colorado River water is blocked from its natural flow and backs up into a huge reservoir, named Lake Mead, near Las Vegas, Nevada. From this point, the water flow is controlled as it continues downstream, sustaining communities throughout the Southwest. The tamed Colorado River sends water to cities from Phoenix, Arizona to Los Angeles, California. 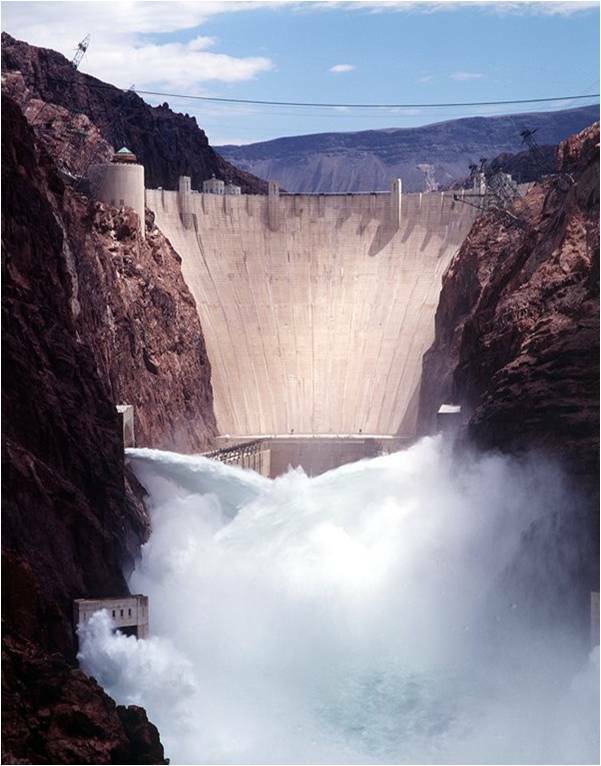 As a byproduct, as the water passes through Hoover Dam, it powers giant generators, creating electrical power. The US government guaranteed the delivery of water to the various stakeholders. However, the Government overestimated the amount of future water available. So, unfortunately, the Government promised more than it could deliver. Government bureaucrats theorized that if one lake could successfully store Colorado River water, two lakes could store even more water. Rafting deep in the silent canyons of Echo Park. The question was: where to locate the second lake. 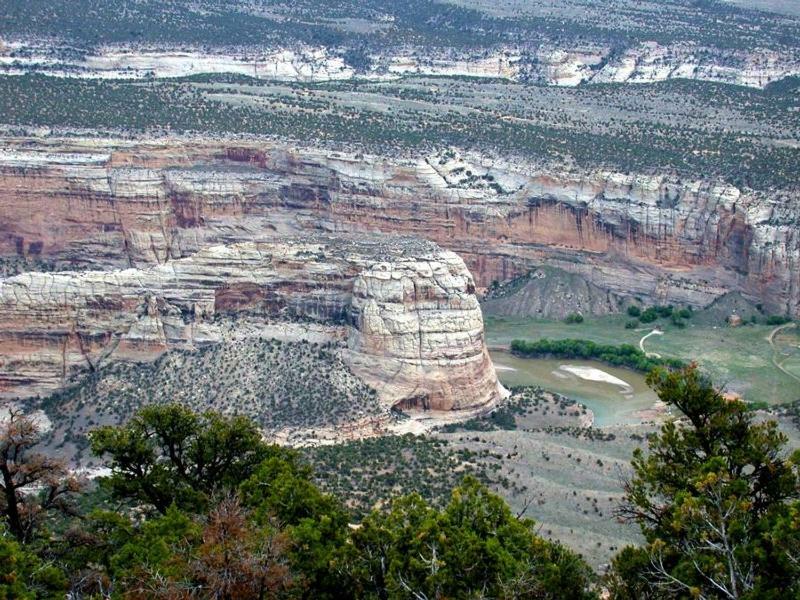 Naturally, with all the empty lands in the West, the Government chose the most beautiful, irreplaceable Steamboat Rock, in the Echo Park district of the Dinosaur National Monument in Northwest Colorado. The choice shocked conservationists, environmentalists and all interested in our National Parks. Hiking on the floor of Glen Canyon. To save the Colorado River at Steamboat Rock from being dammed and flooding over the stunning Echo Park area, conservationists had to find another choice…and they did, far, far down river, in the middle of the vast desert. 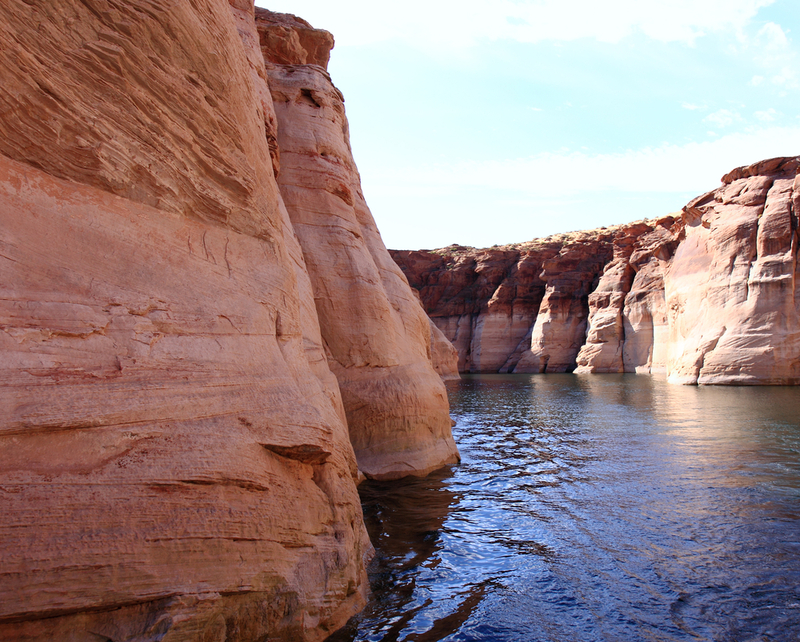 The stunning Glen Canyon was their choice. Some say it was sacrificed. 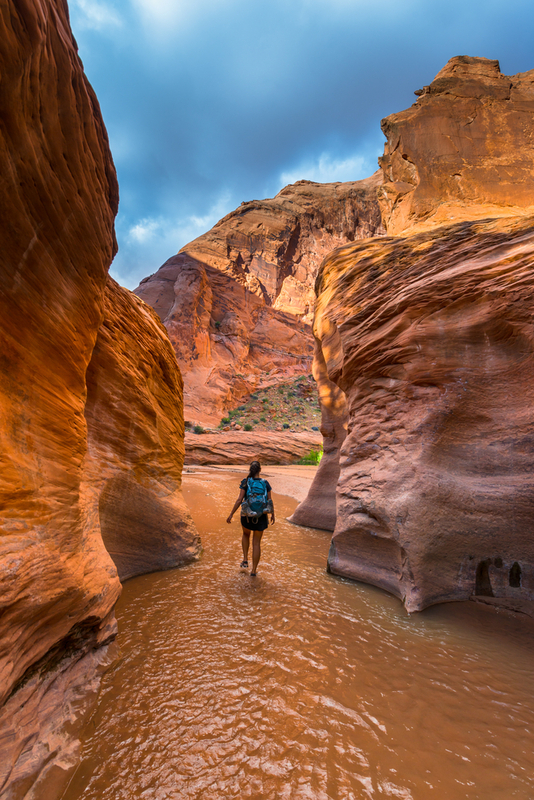 “Glen Canyon died, and I was partly responsible for its needless death,” Sierra Club president, David R. Brower wrote in Sierra Magazine in 1997. 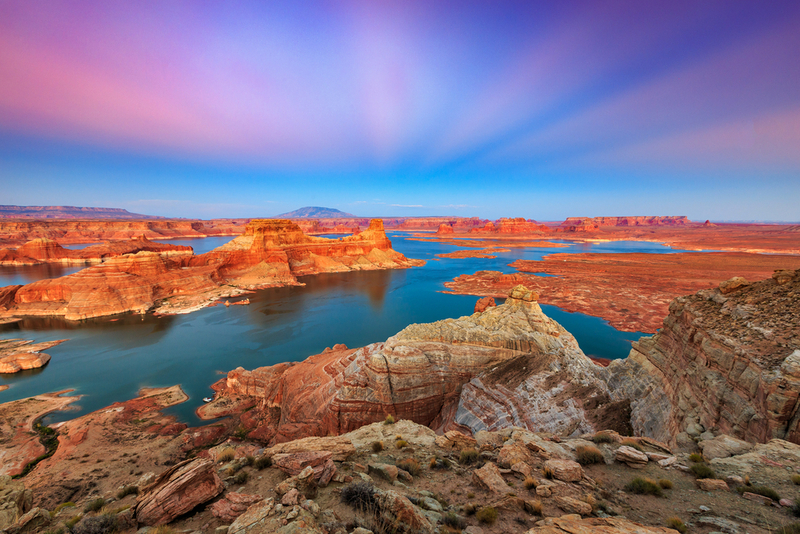 The surface of Lake Powell. The beautiful Glen Canyon is below the water. When I last visited the lake, the view was deceptive. I felt as if I were in a vast hot desert, in the middle of which was this out of place, huge expanse of water with docks, houseboats and tourist facilities. I had to stare at the lake for a moment to fully comprehend that all that water, stretching out endlessly, was actually covering and drowning one of America’s most beautiful canyons, buried far below the surface by tons of water. Two years ago, I wrote about how the drought had lowered the water levels of both Lake Mead and Lake Powell. As I flew over Lake Mead, I could look down and see the rings, like bathtub rings, circling the lake, showing where the water once was and is no longer. It is reported that Lake Mead water is now so low, it is beneath the water intake for the City of Las Vegas. Lake Mead could use a lot more water, but with the drought, nature is not providing it. 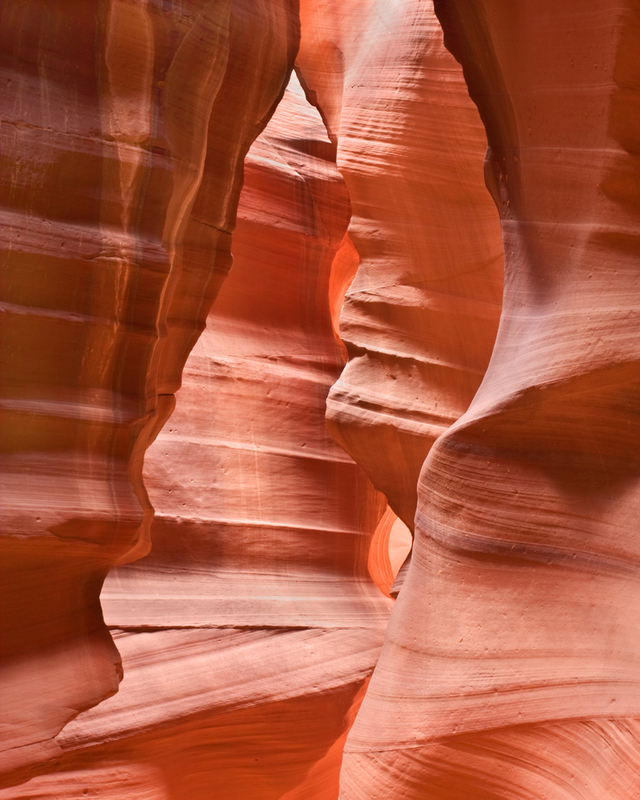 Circular rock shapes in the Antelope Canyon portion of Glen Canyon. That needed water just might be in Lake Powell, covering Glen Canyon. 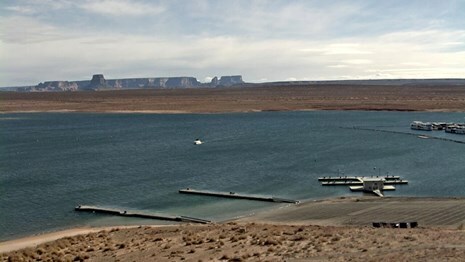 Environmentalists have proposed that Lake Mead be filled with Lake Powell water. If Glen Canyon were drained, it would once more be visible. Visitors could once again appreciate the amazing natural rock and land formations, which are now covered with water. Is it possible to do this without creating harm? I really hope so, because America is such a beautiful country, I’d hate to think that our most spectacular and beautiful places could remain destroyed by mistake. Rings on the Glen Canyon walls, becoming visible as the water level goes down because of the drought. If you would like to give someone a gift of our audiobook, or donate it to a school library, it is available in CD and Mp3CD formats, in stereo, right here on our website.